Tumulus! Trading Cards Collect them all! ‘Tumulus’, barrows and Howe are ancient burial mounds which can be found all over Britain and Europe. ‘Tumulus’ is Latin for mound or small hill which also means ‘swell’, like the swell of an inflated tummy (‘tum’ ulus). Those interred in these burial were often placed in the fetal position like a baby in a heavily pregnant swell of a belly of the ground. Some tumulus contained cremation urns often with special items or grave goods of the deceased interred alongside them but other tumulus, when opened up were empty and so their function has long been argued over. The popular Victorian past time of excavating tumuli, soon fell out of favour when the plundering of barrows for treasure often didn't produce anything except ash and broken pottery. 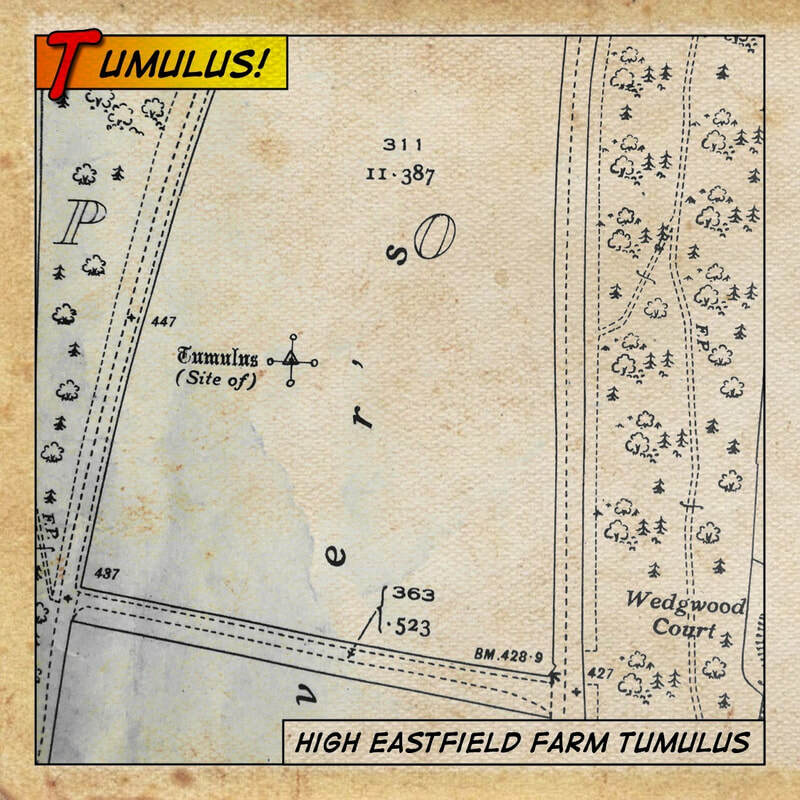 Most tumulus in our vicinity have either been excavated or ploughed flat and sadly there is little evidence that any of the tumuli were ever there, and you only come across them when looking through the old maps. Historian Thomas Hinderwell speculated that the tumuli called The Wheatcroft Barrow Group, were part of a boundary line that formed part of the towns ancient military defences that ran along the back of Oliver’s Mt. He explains that these military defences are the origin of the areas name ‘Weapon’-‘ness’. He also explains that, “this may have been a place for contest”. The area could have been an important meeting place to settle disputes, like a 'Wapentake', a word pertaining to the subdivision of some northern counties but originally meaning a place of assembly or an old council.This makes Olivers Mt a very meaningful place to have the war memorial. 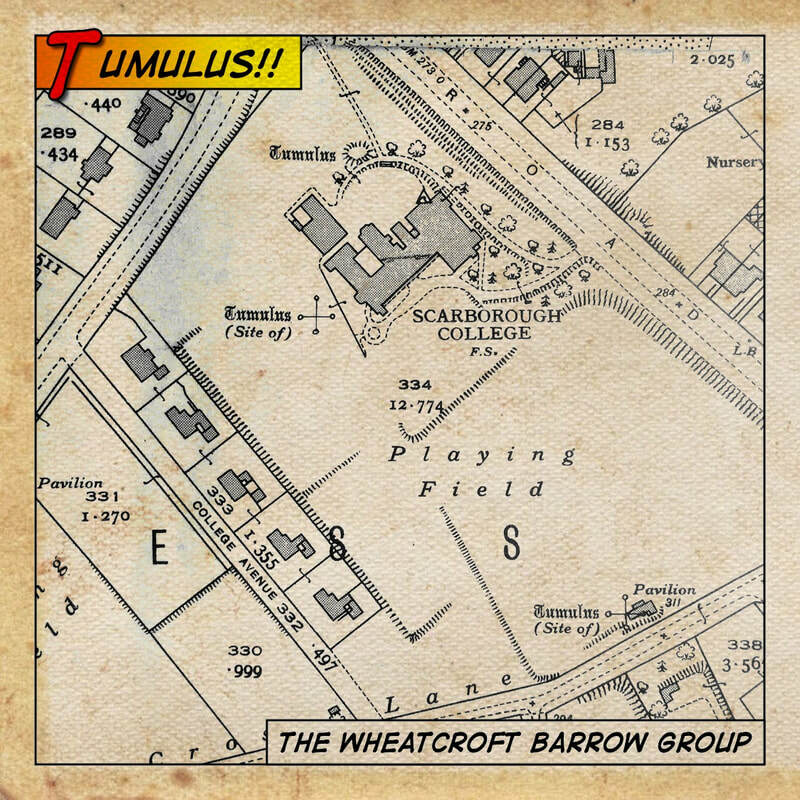 The Wheatcroft Barrow Group must have been imposing structure on the Scarborough landscape. These ancient barrows (tumuli) sat in the grounds of Scarborough College and a lithograph celebrating the opening of this tumulus was made by the artist J. Basire in 1835. This drawing and the grave goods taken from the tumulus can be found displayed in the Rotunda Museum. Wheatcroft, originally ‘Whitecroft’ after ‘White Nab’, was made part the most southerly part of the Parliamentary and Municipal Boundary of Scarborough around the time the Wheatcroft Barrow was opened. Tumulus across Britain as well as being ancient meeting places also became natural boundary markers. The Parliamentary and Municipal Boundary is lined with tumuli and follows two natural water courses. Starting in the north at Peasholm gap, the boundary follows Peasholm Beck to its spring head a few miles inland. 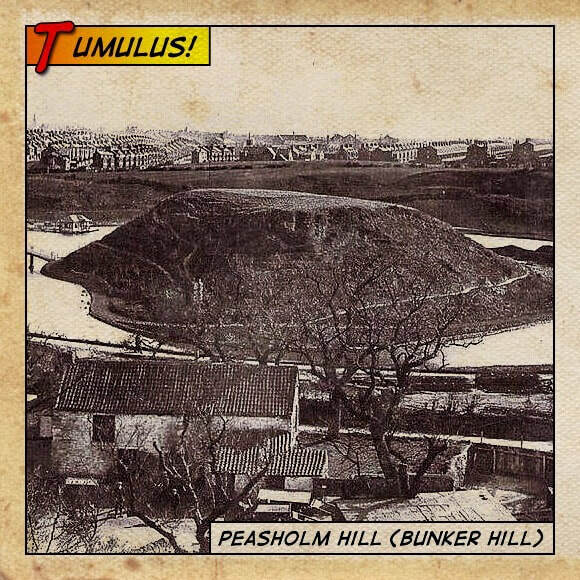 In his 1855 book, the antiquarian Robert Knox, described military defences at Peasholm Gap and speculated that the old defences are the reason for the shape and the flat top of ‘Bunker Hill’, the little hill in Peasholm Park that now has the pagoda. The Wheatcroft Barrow and Sharp Howe line up with two other tumulus along the road from Flixton to Wold Newton, they line up straight, with St James’ Church in Fordon (4) and ‘Ba’al Hill’ a tumulus outside of Wold Newton(5). The phenomenon where a straight line connects ancient sites became know as a ‘Ley’. Alfred Watkins originally coined the term ‘Ley’ in 1921 when he noticed that lots of ancient sites lined up in straight lines. He established a group called ‘The Old Straight Track Club’ who explored the countryside looking for ‘Leys’ and the features in the landscape that connected them. The pastime became very popular as they discovered, through first hand observation, ancient objects and landscape features that were not recorded on the Ordinance Survey maps. ‘Ley Hunting’ became more popular in the 1960’s with the ‘new age’ and ‘hippy’ culture taking an interest in this pastime. The term ‘Ley’ became known as a ‘Ley Line’. 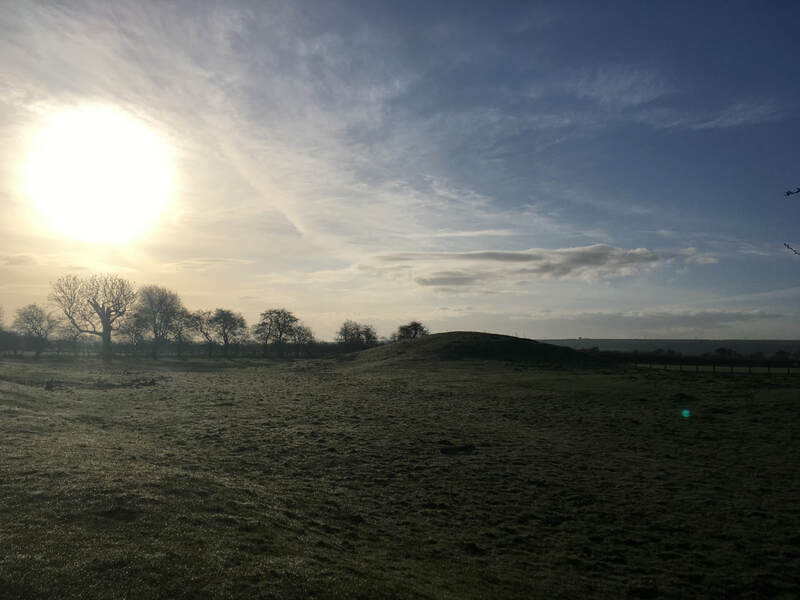 According to the rules originally set out by Watkins, a ‘Ley Line’ is an old straight track connecting natural features in the landscape with shrines, mounds, stones, Roman, Pagan and Christian sites and buildings. He developed a points system which is as follows, Mounds, stones, beacons, circular moats, castles and traditional wells get 1 point. Churches, ancient crossroads and road alignments get ¾ of a point. Fords, clumps of trees, camps, ponds and single trees if ancient and named get ½ a point . Watkins felt a ‘Ley’ would score over 5 points and therefore suggest it to be an ancient track. Wheatcroft landscape, The Cricket Pavilion at Scarborough College (site of The Wheatcroft Barrow), Knox Hill and Deepdale Rigg leading to High Eastfiled Farm Tumuli on the left. (2)Seen from Sharp Howes, the High Eastfield Farm tumuli which sat nicely along on the bridleway at the back of the neck to Oliver’s Mt seems to have been in a prominent location marking the boundary of Scarborough. Now there is very little left of them at all. This area seems to have a great history of marking boundary placement. The River Derwent as it goes inland across the Carrs marked the northern boundary of the East Riding of York. And also prior to 1066 in the time of Edward the Confessor, Flamborough and the Wolds belonged to Harold Godwinson who became King of England, where as the area to the north (including the village of Falsgrave) belonged to his brother Tosi Count of Northumberland who helped provoke the invasions in 1066 by William the Conqueror and Harold Hardrada the King of Norway. 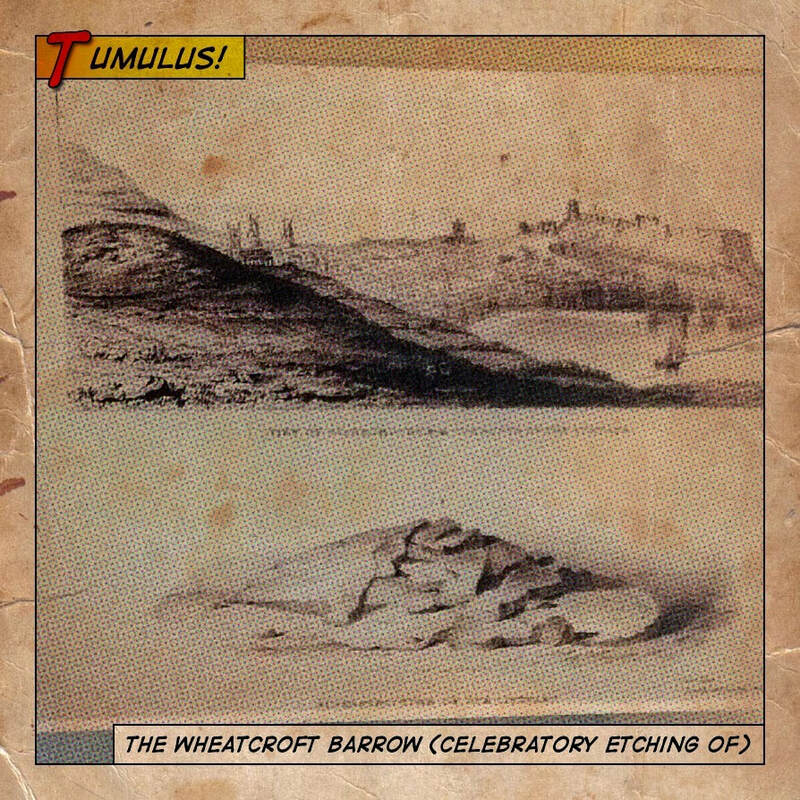 (3)The main Wheatcroft Barrow is actually set back away from the others in the grounds of Scarborough College, which means because both tumulus are visible to each other from their peculiar locations on their respective plateaus. The corner of Jacksons Lane at Deepdale Rigg where it turns back up Olivers Mt is 113ft above sea level. This would hide all the Wheatcroft Barrows from a tumulus around the corner at High Eastfield farm as they are both only 96ft above sea level. But as the main Barrow is set back they can both be seen to each other around the edge of the Rigg, (or could have if they had not both been ploughed flat). What was the purpose of this? Was this a way of transmitting signals, marking direction or territory, or as Hinderwell suggests, where these tumuli part of a place of contest? 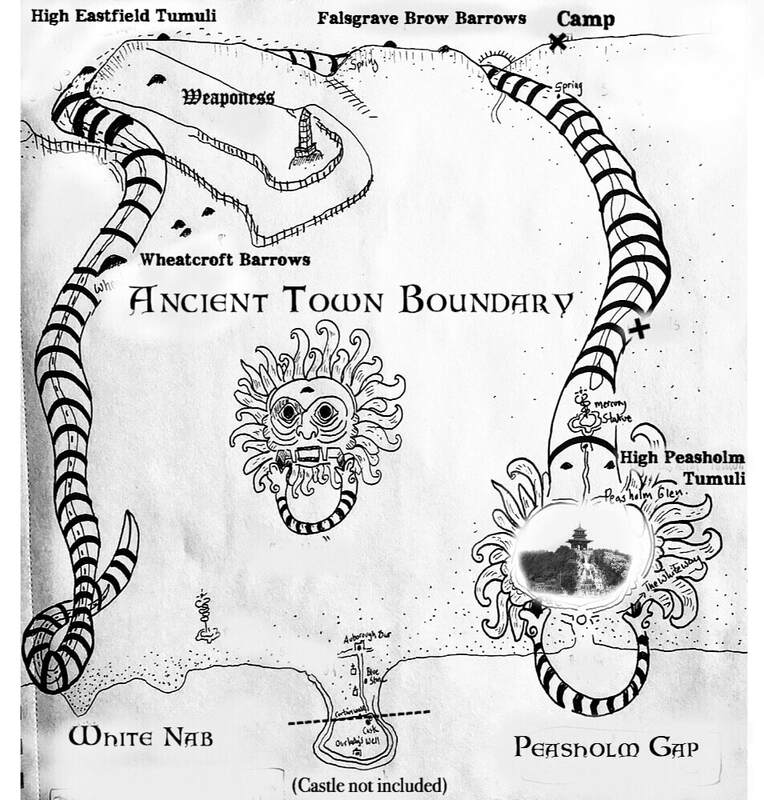 (5) Ba’al Hill is the sister Hill of the famous ‘Willy Howe’ a tumulus with folktales of fairys and treasure. They are connected by The Gypsy Race, a winterbourne stream that flows from Duggleby Howe to Rudston Monolyth the largest tumulus and menhir in the country. ‘Ba’al is the Canaanite Fertility God of the God of fertility, weather, rain, wind, lighting, seasons, war, patron saint of sailors and sea-going merchants, leader of the ancestral spirits. Just how this Canaanite God became the name of a tumulus on the Yorkshire Wolds is unknown. Ba’al is also associated with the Celtic god Belenus, the name sake of the major Ley Line running North South of Britain. Ba’al is also associated with Orion and with the celtic festival of the sun ‘Beltane’. After Note: Interestingly, the ‘Gristhorp Man’, the unusually tall chieftain interred in a grand oak tree coffin like boat buried betwixt land and sea, with mistletoe in his belly, was excavated from a tumulus that lies near to the cliffs at Gristhorpe below White Nab (nob). This tumulus appears to placed adjacent to the bog lands outside of both the Scarborough boundary and the boundaries on the wolds. Historically, according to the antiquarians, the lands to the north were inhabited by the Brigantes tribes, where as the Lands around the Wolds belonged to a faction of the Brigantes called the Parissi. This chieftain was buried in a grand style in neither territory. He can be seen on display at the Rotunda Museum. After After Note: The Whitby Strand (12th century ancient parish boundary) also follows natural water course and tumuli. Following Lyth Beck from Grosmont, the boundary is marked out by Breckon Howe, Robbed Howe, Foster Howes, Loven Howe and Lilla Howe. "An old tradition surrounding the Brothers' Hermitage (in Goathland-just south of the Whitby Strand) springing no doubt from ancient charters. Each new owner seems to have been required for his wellbeing and good fortune to blow a horn on Sill Howe. A shadow of the remaining requirements of the charters to attract and entertain poor travellers and attract them to where there was lodgings and food." - Alice Hollings -A History of Goathland.